MONROVIA, Calif., Feb. 28, 2019 /PRNewswire/ -- SiLC Technologies, Inc., a silicon photonics-based provider of integrated 4D vision LiDAR solutions, today announced initial performance results for its integrated FMCW LiDAR test chip. SiLC's low-energy consumption design, rooted in SiLC's strong silicon photonics heritage, leverages a coherent detection approach, similar to what is currently utilized in today's telecom systems. SiLC's initial data demonstrates a 112m detection range with just 4.7mW of optical peak power. This is very promising, given that traditional pulsed LiDAR systems operate at peak laser power levels in the hundreds, and even thousands, of Watts. SiLC's early stage performance test results were previewed earlier in the month at Photonics West, the leading global conference for biomedical, optics, photonics, and laser industries in San Francisco. Demonstrating the importance of eye-safe LiDAR, this year's CES served as a testing ground of another sort, as concerns around camera and eye-safe LiDAR emerged after a photographer's camera was reported to be damaged from a pulsed LiDAR. Though pulsed LiDAR is the most widely-used in the industry, it's maximum range is dictated by its peak laser power, resulting in bright flashes of laser light that have been shown to be more detrimental to sensors than the newer FMCW techniques. FMCW solutions transmit at more than three orders of magnitude less peak laser power than current pulsed LiDAR solutions while providing improved range, instantaneous velocity and multi-user interference free operation. 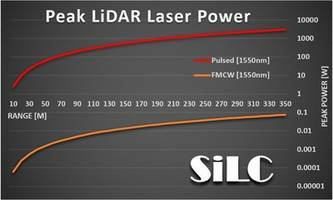 At peak power levels of around 100mW, SiLC's LiDAR solutions will not be capable of damaging eyes, sensors or cameras. "Because our FMCW chip design requires a fraction of the power typically required for LiDAR, it is inherently more camera- and eye safe," said Mehdi Asghari, CEO of SiLC Technologies. "Our integrated chip is a lidar for everything - a solution that can be applied, safely, within any application, and wherever you need it." A long range FMCW LiDAR demands very high-performance levels from the optical components needed. The cost of these components has in turn limited commercial deployment of such systems. SiLCs technology platform is able to offer the performance levels required across all key performance specs including very low loss, ultra-low phase noise, polarization independent operation, low back reflection and high optical power handling. In addition, SiLC's silicon photonics technology enables integration of all key optical functions into a small and low-cost silicon chip. SiLC utilizes silicon wafer fabrication processing technology, which enables complex electronics chips to be cost effectively mass manufactured for consumer applications to manufacture low cost and high-volume complex optical devices such as LiDARs. "We're seeing significant market interest from automotive to augmented reality and biometrics. We believe this interest level will continue to rise as these industries increasingly depend on more sophisticated 3D vision systems. It's our goal to become the LiDAR industry's economic bridge to achieving best in class accuracy and range at a cost that will enable mass manufacturing - a true lidar for everything. It's what our team does and a vision we've successfully executed on in telecom and data center optics for more than 20 years," concluded Asghari. SiLC Technologies, Inc. is a silicon photonics integrated circuit semiconductor supplier located in Monrovia, Southern California. Company's initial focus is on integrated 4D Vision Sensors targeting a wide range of applications. Founded by a group of highly experienced industry veterans with over 20 years of commercial product development and manufacturing heritage, SiLC utilizes silicon based semiconductor fabrication processes to manufacture its chips and standard, automated IC style assembly processes to enable robust, cost effective and compact solutions. Please visit us at Silc.com.